During these last lingering cold months, I find myself craving those hearty, winter root vegetables that are still in season. To me, the most delightful of them all are Brussels sprouts. They’re meaty, filling, and have a robust flavor that pairs well with darker meat dishes (pot roast, steak, ham, sauce-based chicken, and many pasta recipes) which are typically served this time of year. For those of you with children, it’s also an excellent source of iron, vitamin C and fiber. Pediatricians will do backflips if you can get your kids to eat these. I can swear to it that my children actually do eat and enjoy Brussels sprouts. Amazing, right? So what’s my trick? 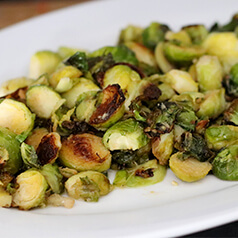 Here is my cheap, easy, and most importantly, healthy recipe for kid-approved, garlic-roasted Brussels sprouts. *The robust extra virgin olive oil allows you to use less and still have an impactful flavor. There are many brands that come in child-safe plastic bottles, so if your kids like to join in on the cooking – there are no glass bottles offered up as tribute. Cut off the ends of the Brussels sprouts and pull off any yellow outer leaves. Cut each Brussels sprout in half. This allows the olive oil to penetrate to the center. Mix them in a bowl with the olive oil, salt, garlic powder, and pepper. Once mixed to your liking, transfer everything to a sheet pan. Roast in the oven for 30 to 40 minutes* or until crisp outside and tender inside. Shake the pan from time to time to brown the Brussels sprouts evenly. Allow to cool for 5 minutes and then serve. *Ovens can vary in temperature, so the timing will also vary. Just make sure to check about every 10 minutes, and you will do fine. If you hate the smell of broccoli or Brussels sprouts cooking (like my children) it’s because of the sulfur being released from the vegetable. Instead of immediately transferring the Brussels sprouts to the sheet pan to cook, you can marinate them in a sealed Ziploc bag for at least an hour. This allows the gasses to be released prior to cooking and should limit the smell. You will actually see the bag expand. This will also soften the Brussels sprouts and help remove the bitterness that you may find distasteful. Then, continue on to cooking as instructed above.